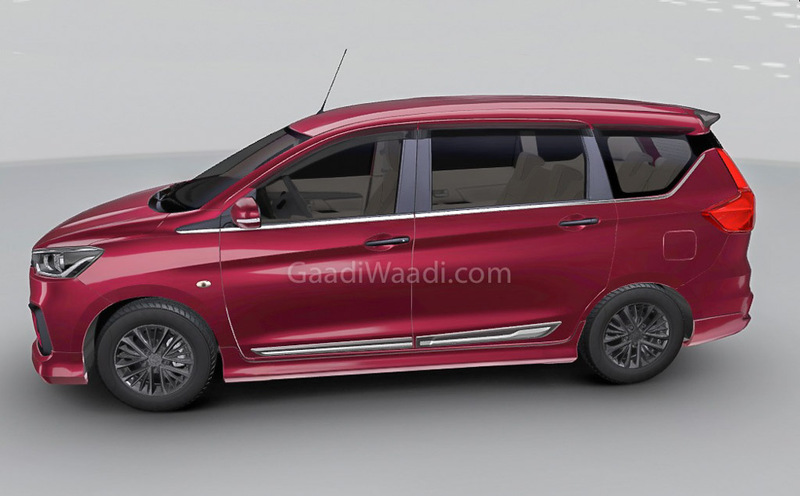 The second generation Ertiga MPV officially went on sale on November 21 with prices ranging between Rs. Rs. 7.44-10.90 lakh (ex-showroom). Maruti Suzuki India Limited (MSIL) has high hopes with the best-selling affordable MPV in the country and instead of positioning it as a premium offering, about 2,200 Arena dealerships will sell the seven-seater due to its volume importance. 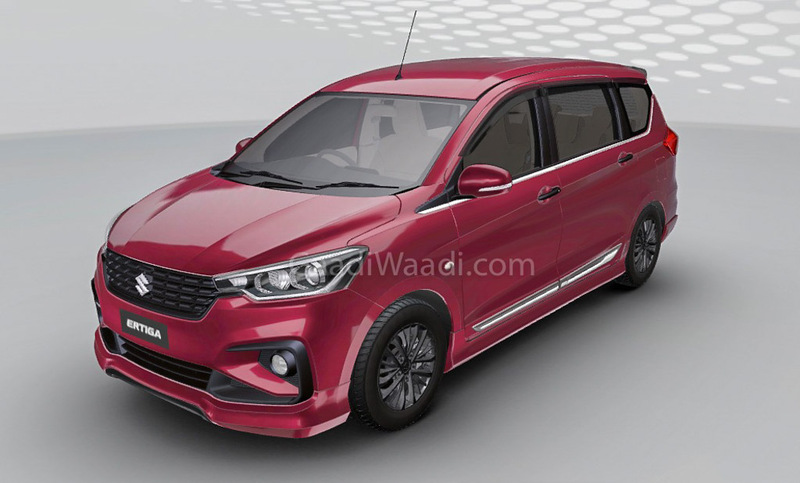 The 2018 Ertiga has become more modern and upmarket in its latest avatar and as we exclusively revealed yesterday, it will spawn a six-seater sportier sibling bound for Nexa premium outlets. 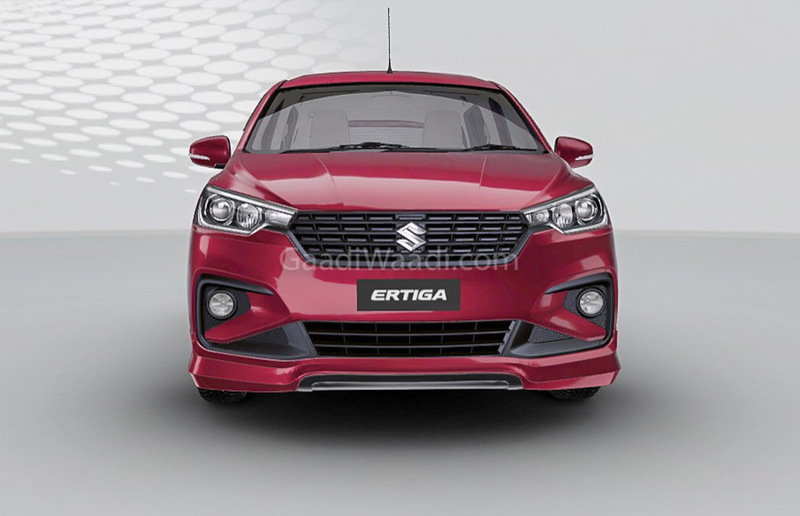 Currently, the Ertiga is retailed in ten variants and can be individually personalised based on the customers’ preference with factory-made accessories. 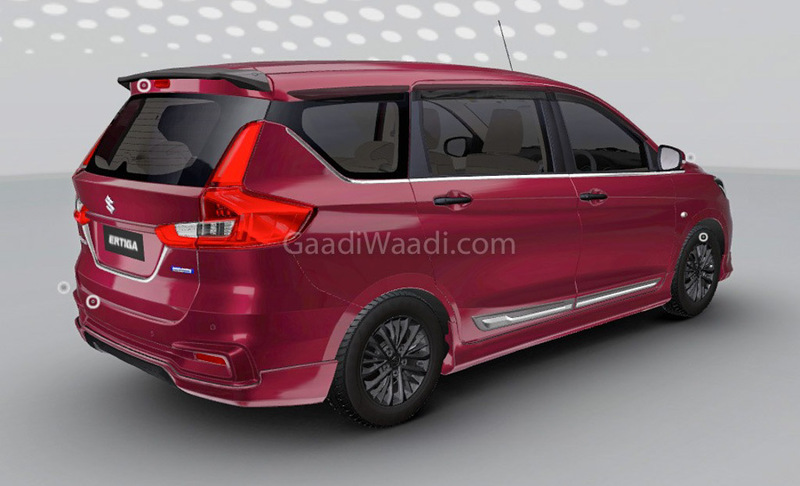 The car configurator section on Maruti Suzuki’s website will give you virtual preview of how the accessories will look like when they are bolted on the MPV. Here we have a set of digitally customised images with the base variant chosen for the modification. It is fitted with a blackened front grille and new set of alloy wheels but the major visual enhancer is the aggressive body kit. The front bumper has become bolder with the fitment of the body kit that also allows for sporty side skirts, side moulding trim and more-than-ordinary rear section with boot lid spoiler. 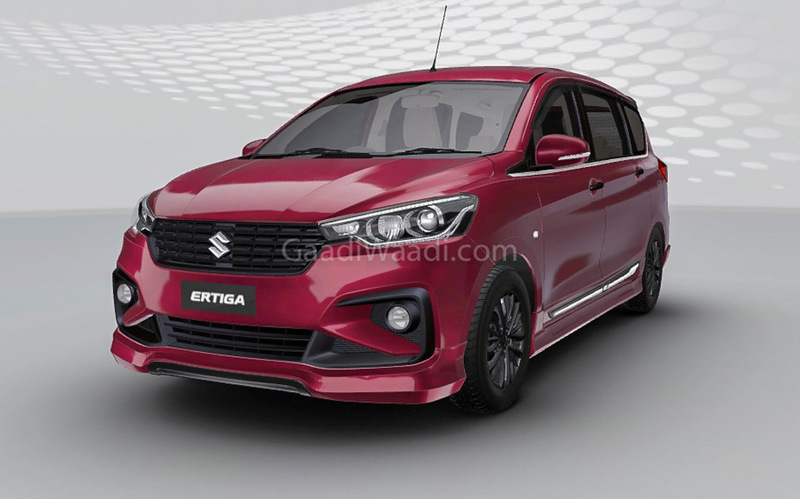 Maruti Suzuki offers Ambitious and Indulge packages with the new Ertiga while buyers also have the choice of selecting separate accessories from car perfume to 15-inch alloy wheels. 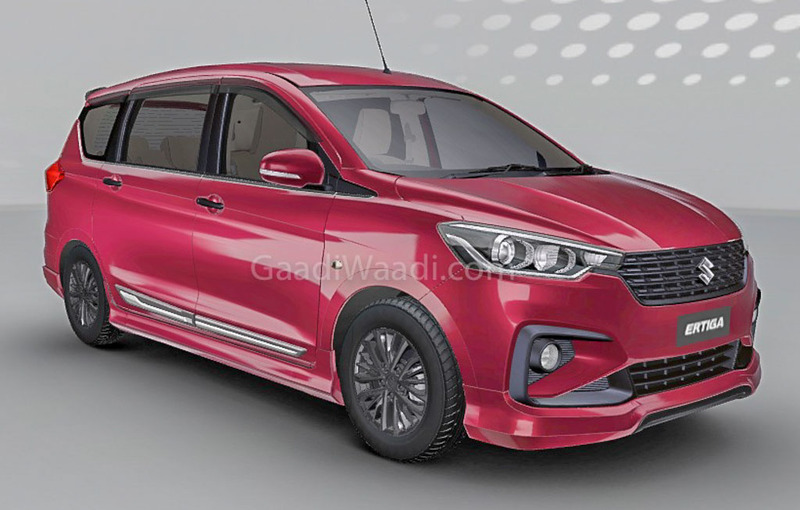 The Ambitious package provides window frame kit, tissue box, steering wheel cover, designer mats, bumper corner protectors, reverse parking assist in IRVM, rear upper spoiler, box finish lining seat covers and body side moulding with chrome insert. The Indulge accessories include body side moulding garnish finish, deluxe carpet mat, nautical star finish seat cover, rear bumper garnish, etc. 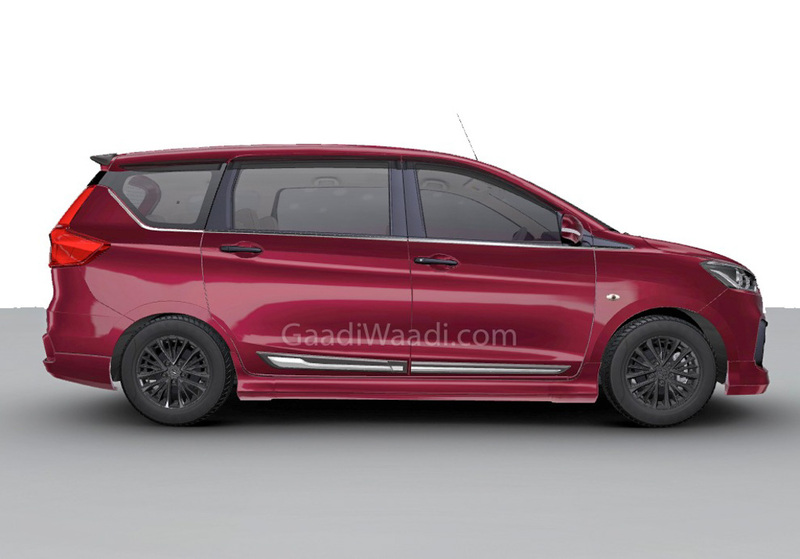 Based on the lightweight fifth-generation Heartect platform, the regular Ertiga boasts a thoroughly revised exterior and it takes power from a newly developed 1.5-litre K15B mill that debuted in the facelifted Ciaz with 104.7 PS at 6,000 rpm and 138 Nm of peak torque at 4,400 rpm. It is mated to a five-speed manual transmission as standard and a four-speed automatic is offered as optional with 19.34 kmpl and 18.69 kmpl mileage respectively. The 1.3-litre diesel unit has been carried over with 90 PS and 200 Nm but changes have been made to make it more fuel efficient as it is claimed to deliver 25.47 kmpl.